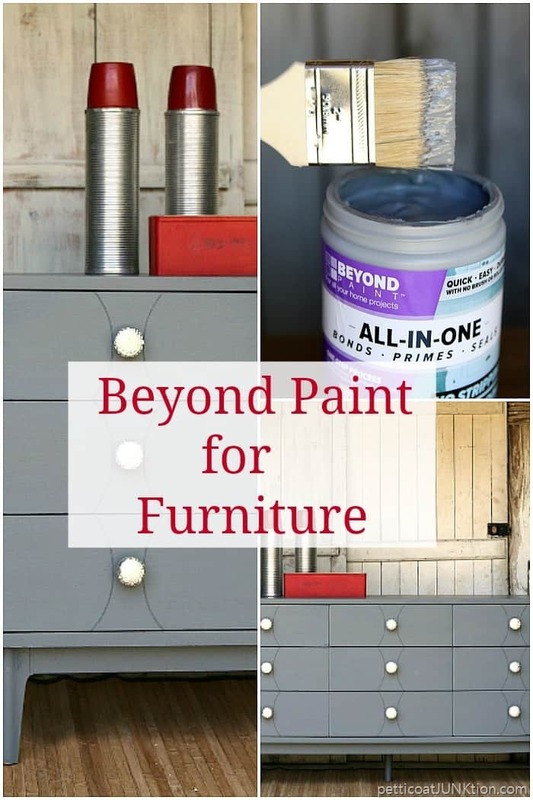 I’m sharing Beyond Paint furniture painting tips and a new Beyond Paint furniture project today. I’ve painted hundreds of projects using Beyond Paint. You guys have heard me talk about this paint over and over. I bought a quart of the paint when it first came out in 2011 and have used it ever since. Why do I like it so much? No sanding, no priming, no sealing required. What’s not to love about that. I use Beyond Paint for home decor accessories as well as for furniture. The paint has new labeling and a new name. 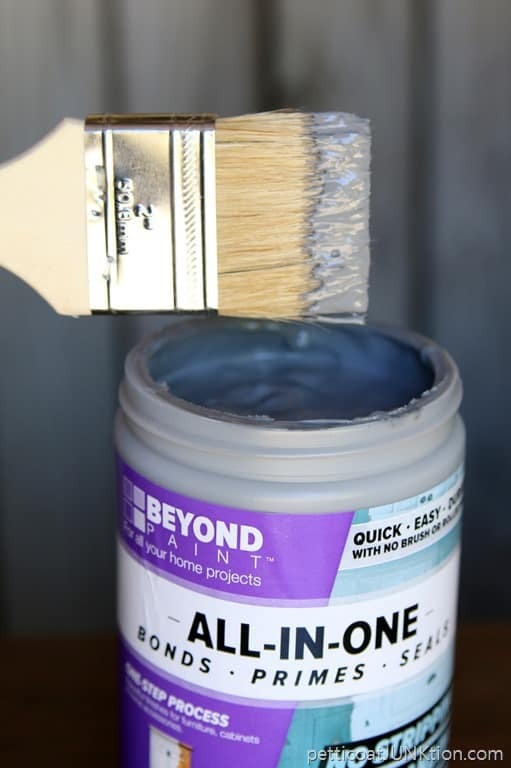 Instead of Reclaim Beyond Paint….it’s simply Beyond Paint. The paint is a little thicker than other paints. It’s almost like a gel and brushes on like butter. The sheen of the paint is similar to eggshell, not flat, but not too shiny either. Just right. You can use a foam roller or brush with the paint. I like to use a roller if the furniture is large and doesn’t have a lot of details like carvings, etc. This is my project piece before painting. Yes, it came from My Favorite Junk Shop. I paid $40 for it. Awesome. The dresser was Army property at one time. There was an inventory tag stapled to the bottom of the dresser. I love the style. Really popular now. Of course an update with paint and new knobs just makes it better. I filled the original hardware holes with wood putty and drilled new holes for the fancy knobs. Who would guess this is the same dresser. 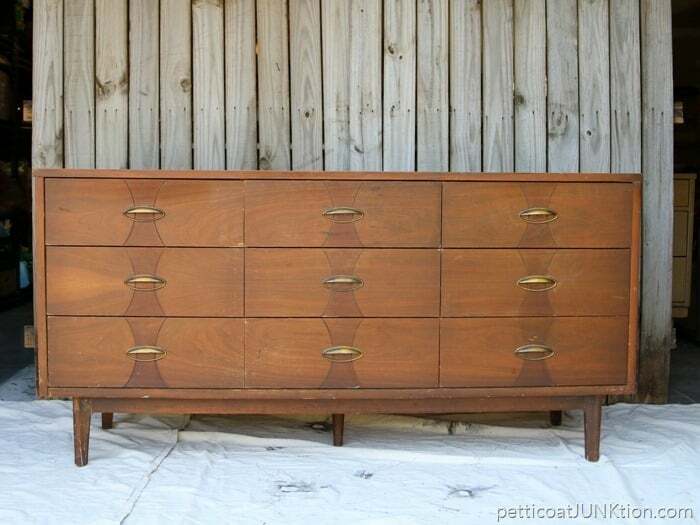 I keep calling it a dresser but it could be a credenza. I removed a few metal pieces from the backside so I think it had an attached mirror at one time. So I’m going with dresser. I painted the drawers then moved on to the body of the dresser. I applied two coats of paint. The paint dries really fast and I was able to apply the second coat of paint an hour after the first coat. I made a short video of the paint process…. How fun is the red vintage thermos set. I found it at a local antique store and had to have it. I love red. The set was still in it’s original brown faux leather case. At $12 it was a deal. 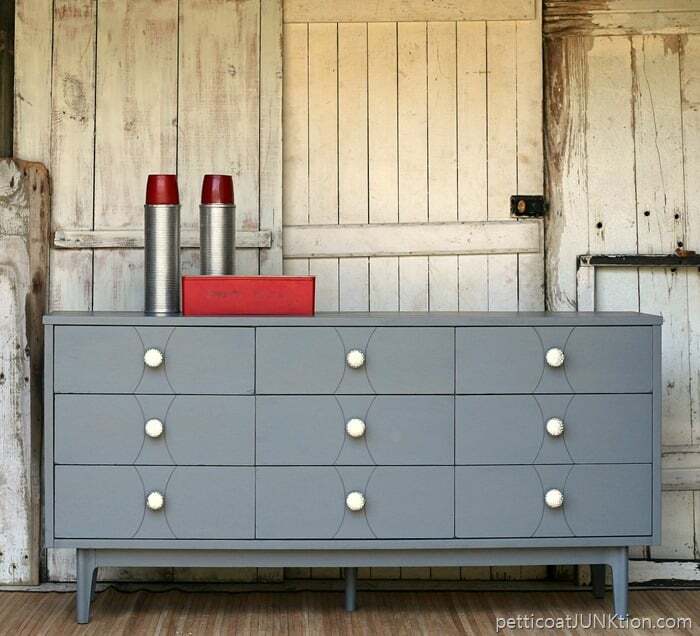 The pops of red are gorgeous with the Pewter gray. Christmas will be here soon and I bet the thermos set shows up in my Christmas décor. 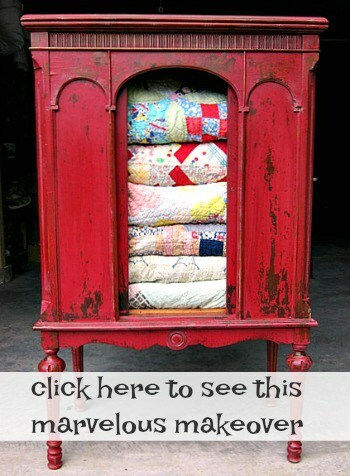 I can see the dresser used as a TV stand or maybe in a foyer……or heck…..as a dresser. I took it to the shop last week. Hope someone falls in love with it and hauls it home soon. 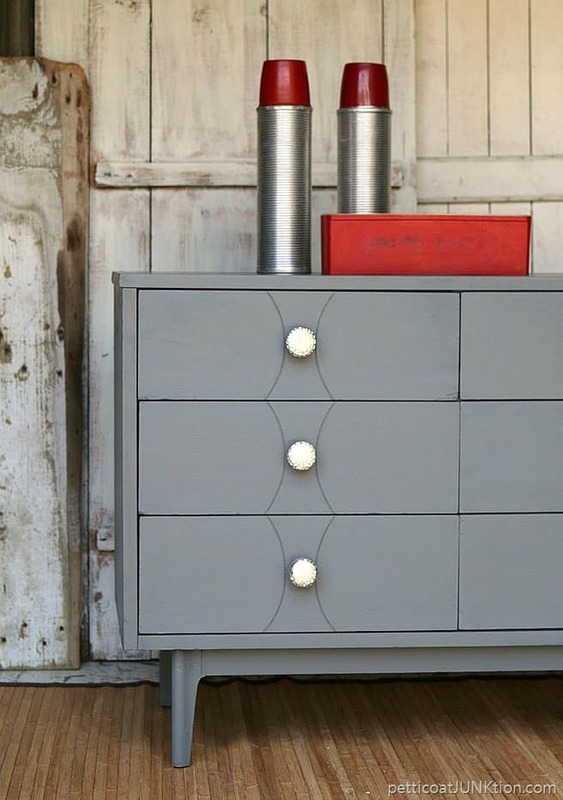 A few of my favorite Beyond Paint projects can be seen by clicking here…..15 Beyond Paint Furniture Projects. Find Beyond Paint on Amazon. 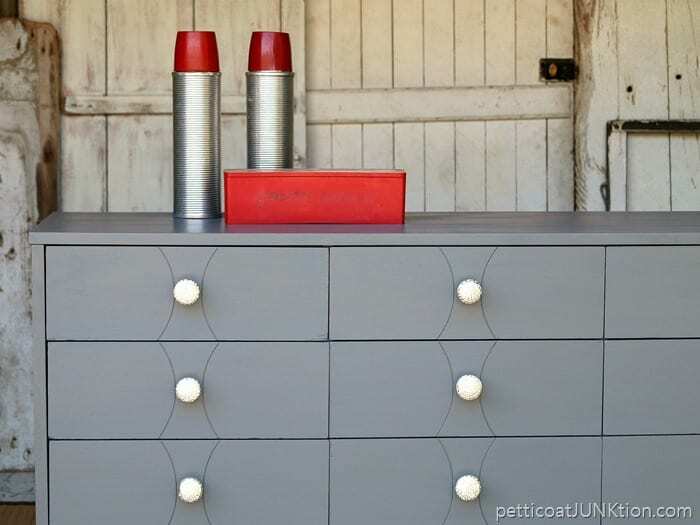 Disclosure: This project is a collaboration between Petticoat Junktion and Beyond Paint. All photos, project ideas, and opinions are my own. The make-over of the dresser gives it a totally different look. I didn’t really like it before you painted it, but after it’s very attractive. A question about the paint. In the close-up of the paint brush on the dresser there are quite obvious brush strokes. And you said that the paint goes on quite thick so I was wondering if the brush marks disappear when the paint is dry. Hopefully they do. I would like to try it as it sounds so easy to use with no sanding or priming. Thanks for the post, Kathy. Would you recommend this paint to paint the bathroom cabinets? 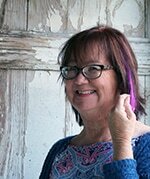 Thank you once again Kathy for bringing beauty into my morning! Looks great! I see it is $129 US a gallon. 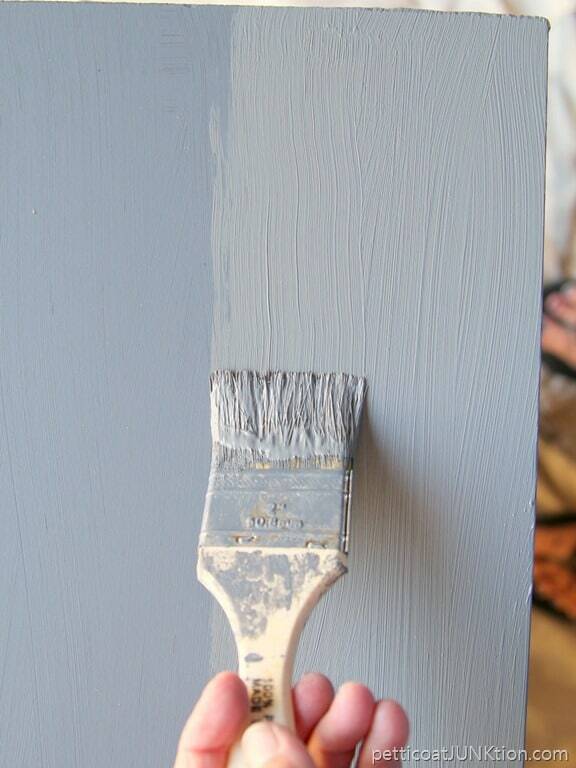 If it goes on thickly, two coats, what would you estimate, the cost of paint for a project such as that item? Hi Gail, I buy the quart size. This piece took less than half a quart. The paint goes a long way!!! Thank you for the prompt reply! Very helpful and appreciated. So could I use this on the 40 year old wood cabinets in my kitchen? Thanks for sharing! I’m going to get some of that paint. Great job on the dresser! I love it! 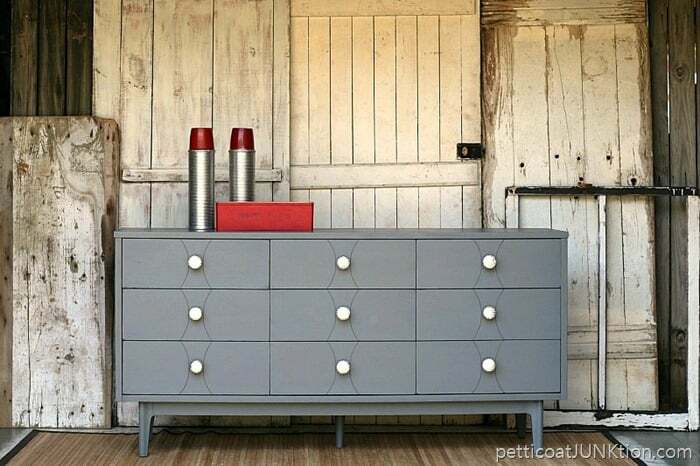 The color is wonderful and I love the knobs! Love…Love….this video and I cannot wait to try Beyond Paint. You make it look so easy and simple. Love all that you show us and how you open up about everything. Thank you so much for allowing us into your life. Have a great week. I think this is one piece of furniture that I would have left “natural” to celebrate its 50s stamp. My house was built in the late 50s and I’m trying to bring back furniture and decor fitting that decade. I would have polished it up and let the woodtones shine! Otherwise, the paint job looks great! What a pretty color! The dresser looks really nice. I haven’t heard of that brand of paint, but sounds like great stuff. I’m wanting to paint my bathroom cabinets with as little work as possible. I was going to go with chalk paint, but I may look at this kind first.